My online dating days preceded Tinder, so I’ve never actually swiped right and left as so many millennial have. However, that didn’t stop me from recently wondering: Why isn’t there a Tinder for food? Here’s the idea: The app–we’ll call it Taest–would be geared towards helping you find interesting, delicious dishes in your area. You’re presented with photos of specific food, and you either swipe right or left to indicate your interest. Granted, there is an app that already does this. 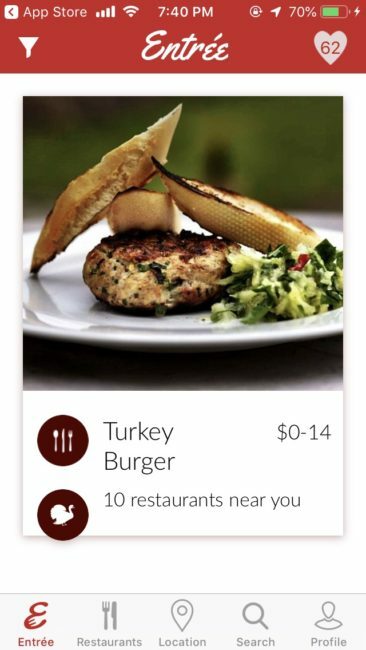 Entree focuses on helping you make a decision about food. However, as far as I can tell, the information only goes one way (from you to the app). It removes what makes Tinder so compelling–the Tinder app acts as a mediator, determining matches when both people swipe right. This is where Taest would shine. In addition to you selecting delicious-looking dishes, the restaurant would also be empowered to select you. This could either be a general “you,” as in “anyone who selects the curry chicken” or even specifically YOU based on your average tab at any restaurant visited through the app, your location, or how often you’ve been to that restaurant (the restaurant would indicate their preferences in settings–they wouldn’t literally be thumbing through matches all day). When a match happens, the restaurant could offer a way to entice you to visit and get the selected dish (a discount or free add-on). The one danger I can think of (perhaps you can think of others) is that restaurants could come under scrutiny for profiling people. However, the app could make sure to withhold information like race, age, and gender so restaurants can’t make a decision based on that information. Again, I don’t know what it feels like to use Tinder, but I bet there’s a little burst of endorphin when you discover that someone you thought was cute/interesting also finds you cute/interesting (actually, I did experience that with women on OkCupid and Match.com, just not in such a simple format as Tinder). I wonder if that feeling could be captured by matching with a restaurant too. This entry was posted on Monday, April 15th, 2019 at 8:21 pm	and is filed under restaurants. You can follow any responses to this entry through the RSS 2.0 feed. Interesting idea, and I think there’s something there that could work, but I’m struck by this — if I’m the restaurant, why wouldn’t I flood Taest and target everyone? Isn’t that in my best interest from a marketing/advertising perspective?